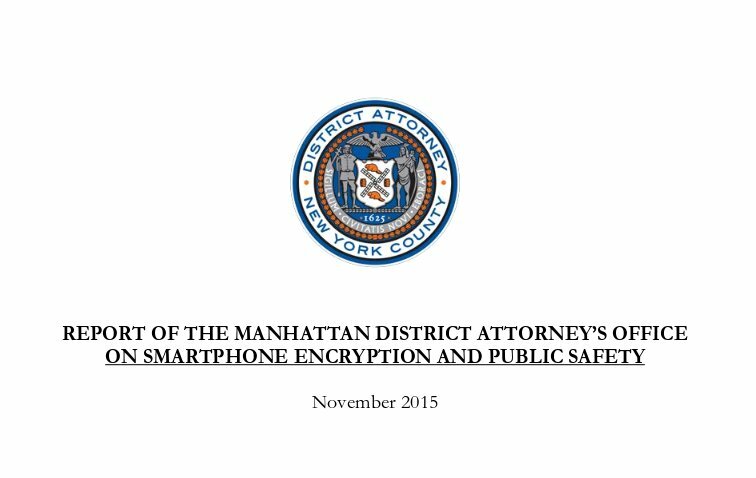 A new report from the Manhattan District Attorney calls for law requiring "any designer of an operating system for a smartphone or tablet manufactured, leased, or sold in the U.S. to ensure that data on its devices is accessible pursuant to a search warrant." Smartphones (a marketing category with no legal definition or firm boundaries) are general-purpose computers, capable of running any code that will compile, including the myriad of end-to-end cryptographic communications tools currently extant. There's no practical way for a smartphone vendor to give me a computer capable of running all the valid programs, but still grant law enforcement access to the data stored on it if I don't cooperate. There is, however, a very impractical way: the vendors could come up with a secret backdoor for my phone, perhaps a keylogger that stores all my keystrokes (including the passphrases for my secret files), and hope that I never discover and disable this. The technical term for this security model is "wishful thinking." The alternative is to just have phones that, out of the box, don't have working crypto. That would require criminals who want to have secrets from the police to download and install their own software. This is something that law enforcement agencies ensure us criminals are already doing.